Stitches South was fabulous! And will be again next year! We met sooo many of our customers and made many new friends! We were thrilled with the warm welcome we received from everyone - thank you for sharing your time with us! A new yarn we brought special for the show was Ivy Brambles Pure Silk, which was on display with a gorgeous lace pattern designed by Joanne of Jocre Arts. 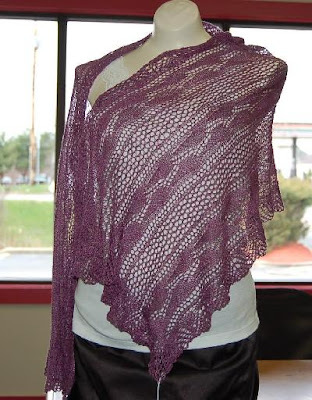 The pattern is called The Lacey Scarf pattern and called out to mostly everyone walking by the booth.... just one touch and everyone agreed that the 100% Pure Silk was simply heaven. This Ivy Brambles Pure Silk yarn has become a favorite lace yarn of many at the show - the colors and the feel of the yarn make it irrestible. We hope to see many of these scarves walking around the show next year at Stitches South in April 2010! 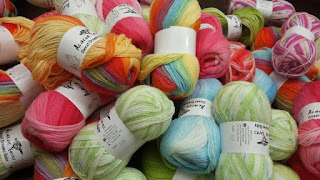 Other new lines introduced at the show included Knitting with Friends (T shirts and notions), Sereknity Yarns, Serendipitous Ewe sock yarns, Cherry Tree Hill Semi-Solids and other Ivy Brambles Yarns all of which were well received. We also brought the entire range of colors from Cascade's Eco-Wool and Eco-Wool Plus to the show - lots of knitters will be wearing this new coat featured in the Sally Melville Mother and Daughters Knit book which takes 3-5 skeins of the Cascade Eco - great yarn, greater yardage, and even greater price for this lovely coat! As everyone adored the new Knitting With Friends Needle Gauges, we are offering a free gift to all customers on purchases of $99 or more. 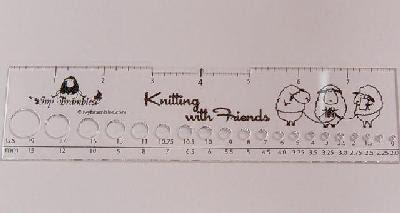 Simply add one of the Knitting with Friends Needle Gauges to your cart and enter the following code - F3PKX - at checkout in the coupon box and receive the needle gauge free with your order of $99 or more. Limit one per customer. A quick fyi, we just received the new Addi Click interchangable needle system. Now Addi Turbos are available in an interchangeable needle set. 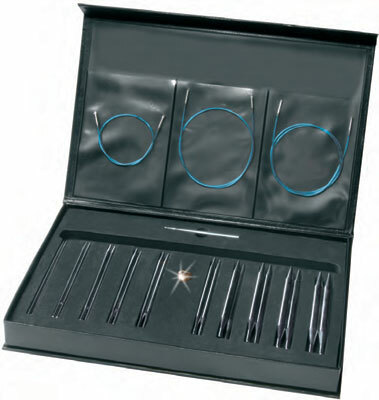 The set includes 10 sizes of needle tips ranging from size 4 to size 15, ultra flexible blue cords in 24", 32" and 40" length, and a connector piece to join cord lengths. The connector also lets the knitter turn the cords into a stitch holder. Needle tips click securely onto the cords without the use of a tightening tool, so they are easy and fast to change and stay put until you're ready to switch to another size. Upcoming events in the very near future - we will be at the 3rd Annual Sheep and Wool Fiber Festival at the Coggeshall Farm, A Living Musuem in Bristol, RI this weekend on Saturday, May 16 from 9 - 4 and we will also be at the Londonderry, NH Spring Fling Craft Fair this upcoming Saturday from 10 - 4:00 - Come and say Hello!